Pharmacies are busy places. 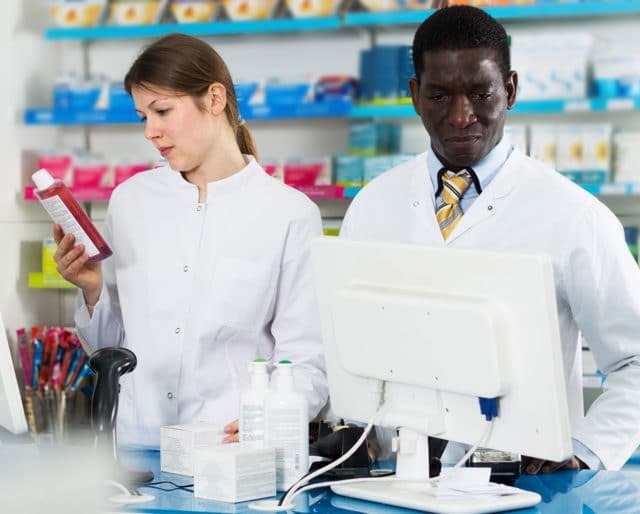 Pharmacy technicians perform vital duties in support of pharmacists — counting pills, entering patient data, waiting on customers, and explaining the use and effects of drugs and medical devices. Pharmacies couldn’t run without them, and they deserve a day of appreciation for all their tireless work! And yes — we need their help! The world's first drug stores appeared in Baghdad. By the ninth century the government regulated them. If only we could tip pharmacy techs! Failing that, a teddy bear, balloon, box of chocolates, or a nice flower to brighten up their workplace (artificial, so as to keep things clean) is sure to light up their day. National Pharmacy Techs Day happens to land right in the run-up to flu season, and most pharmacies offer flu shots. Seeing your pharmacy tech for a flu shot now is a great way to ensure you don't have to see them under less happy circumstances later. Pharmacies can have hundreds of people in and out in a single day, and most of those customers aren't there to socialize. Simply taking the time to tell a pharmacy tech you appreciate them can make a pharm tech's day. ​Agatha Christie, the best-selling author of all time, worked during World War I as a pharmacy tech for a hospital, dispensing medication to wounded soldiers. It is usually the pharmacy techs who actually count out and/or measure our medication. If it were not for their tireless attention to detail, our health could be in danger. The average pharmacy technician works long shifts — eight, 10, even 12 hours — on their feet. And because many pharmacies are open 24 hours a day, pharmacy techs often work nights and weekends, all so that we can have our medication as soon as we need it. Let's face it — no one goes to the pharmacy because they're feeling good. More often than not, we're sick, cranky, and we want to get out of there. Pharmacy techs know this, and provide us with the service we need and the smiles we want on our worst days.